Steve Mertz has been writing great mystery and action/adventure novels for a long time, but there's something special going on when he sets his stories against a music industry background. A longtime bluesman himself, Mertz brings a passion and enthusiasm to his music-themed novels that elevates them and makes them some of my favorite books of recent years. Such is the case with his latest, JIMI AFTER DARK, which finds Jimi Hendrix in London and in all sorts of trouble, besieged by women, gangsters, and maybe something even more sinister, with only the narrator known as Soldier (an old friend from Hendrix's army days) to help him. 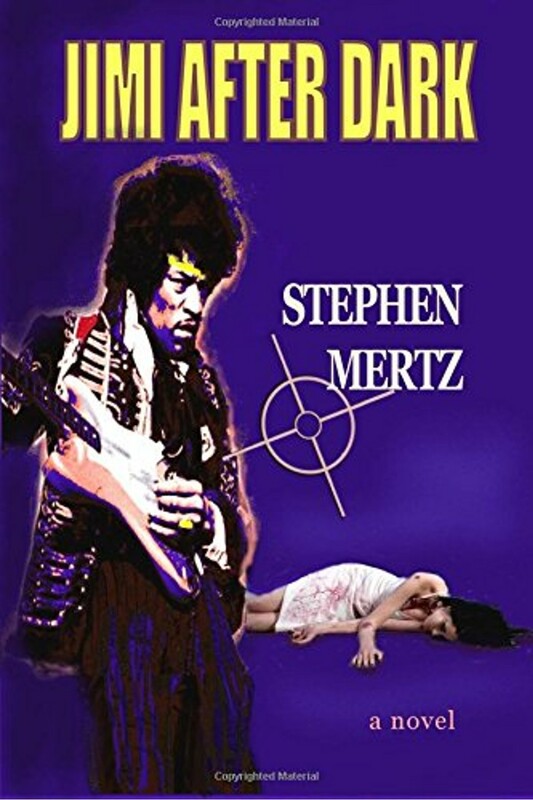 Based on both documented history and events that may or may not have taken place, JIMI AFTER DARK is fast-paced, full of action and plot twists and interesting characters, as well as a vivid depiction of the London music and club scene during the Sixties. Plus that special Mertz magic mentioned above. I think HANK AND MUDDY (featuring Hank Williams and Muddy Waters) is still my favorite of his novels, but JIMI AFTER DARK is a very, very close second. Highest recommendation on this one. 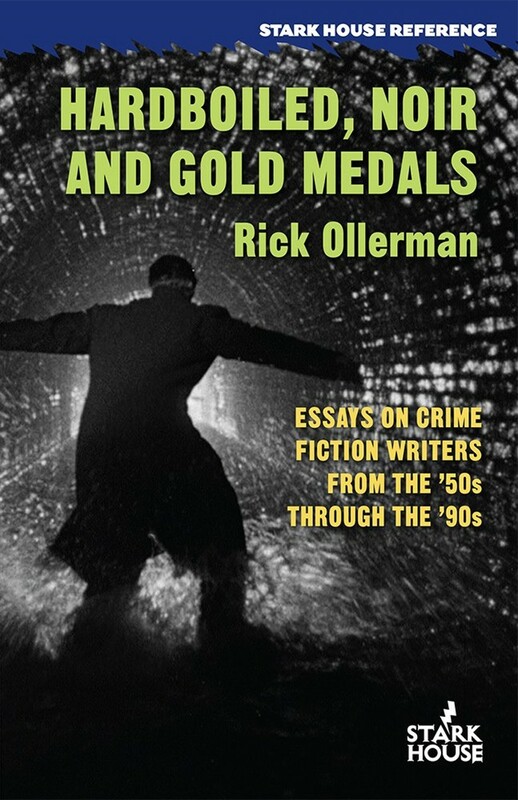 Anybody who's read many books from Stark House Press knows that Rick Ollerman's great introductions are often worth the price of the book by themselves. Now all of those essays have been collected in this volume, along with a number of new ones written for this book. 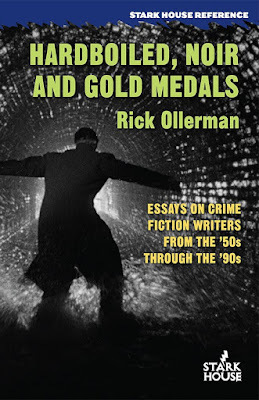 If you have any interest in hardboiled and noir fiction, this is a collection that you'll find yourself dipping into again and again. Great stuff, and highly recommended. 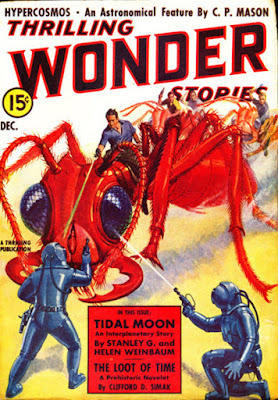 It's been a while since I've featured a pulp with a giant ant cover. 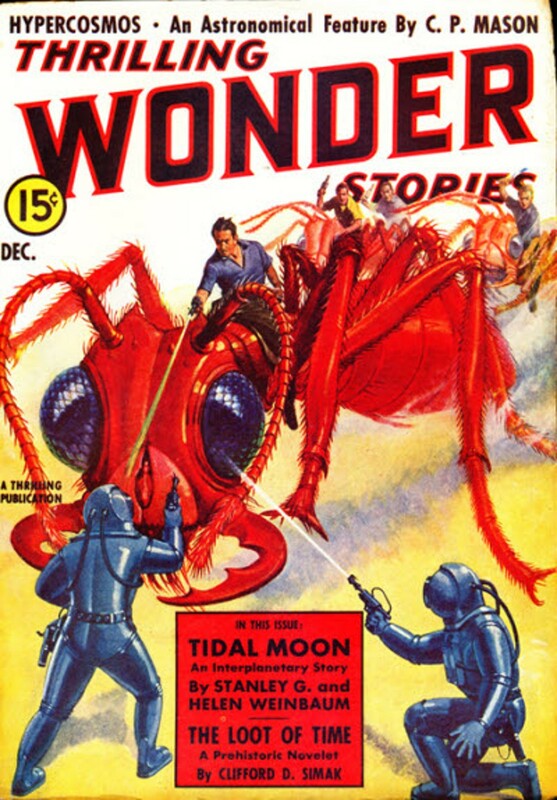 Actually, I'm not sure I've ever had a pulp with a giant ant cover on here. But I like this one a lot, and based on the authors, a lot to like inside the issue as well: Henry Kuttner twice (once under his own name and once as by Will Garth), Edmond Hamilton, Clifford D. Simak, Stanley Weinbaum, Ray Cummings, and Eando Binder (actually Earl and Otto Binder). Looks like a fine issue. And I know what my dad would have done if he'd ever been confronted by a giant ant like that. He would have got himself some giant ant dope. This is a pulp I own and read recently. The scan is from the copy I read. Novellas have become just about my favorite length of fiction over the past few years as my time (and my attention span) have decreased, so I really enjoy pulps like this. I remember reading at least one novel by Leslie Ernenwein and enjoying it, but that didn’t prepare me for just how good his novella “Rampage Range” is. There’s nothing special about the set-up: Jim Maiben is released from Yuma Prison after serving three years for arson (a crime he didn’t commit, of course) and returns to his home range to find that his ranch has been sold out from under him by the bank, everybody believes he’s a criminal and doesn’t want anything to do with him, and naturally there’s a bunch of rustling going on, too. Oh, and the guy who took over Jim’s ranch has a beautiful daughter. Well, with a plot like that, you’d think that you knew everything that was going to happen in this story . . . but you’d be wrong. Some of the characters turn out to be different than what you’d expect, and if in the long run things are resolved in typical fashion, getting there takes some unusual twists and turns. Ernenwein’s style is very effective, too, hardboiled in places, poetic in others, and there’s a surprising amount of sensuality as well. This story reminded me very much of the work of L.P. Holmes and made me eager to read something else by Ernenwein in the near future. Seems like I've read stories by Bryce Walton before, but I couldn't tell you anything about them. 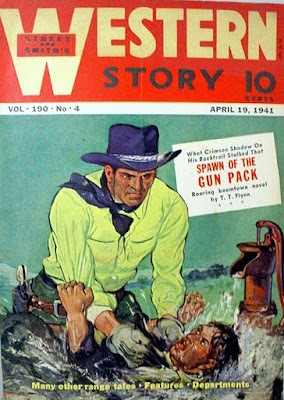 He's best known for science fiction and hardboiled crime yarns, but he wrote quite a few Westerns for the pulps as well. 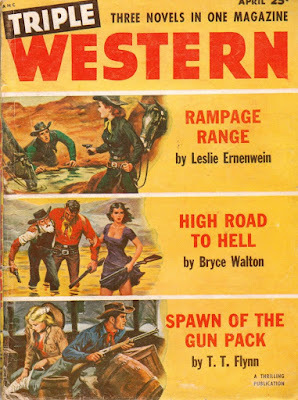 His novella in this issue, "High Road to Hell", also has a standard plot: a drifting outlaw becomes involved in a range war between cattlemen and nesters. It's very reminiscent of SHANE, although this story had to have been written before the movie came out. Walton could have been influenced by Jack Schaefer's novel, though. More likely it's a case of there being only so many plots in the world. Walton's novella is pretty good, written in a hardboiled style that suits it well, and the action in it hardly ever lets up. There's one major coincidence in the plot that's a little hard to swallow, but other than that I enjoyed "High Road to Hell". Next up is a short-short by Jonathan Craig, better known for his police procedural novels published by Gold Medal and assorted other hardboiled crime novels. "Slow Poison" is a psycological suspense tale about a man searching for his wife and the man she ran away with. (As I was reading it, I kept hearing Moe Howard in the back of my mind, saying, "Niiiiiagara Falls!") There's nothing particularly Western about this one—it could have played out almost exactly the same in a modern setting—but Craig is a good writer and makes a readable three pages out of not much. The novella "Spawn of the Gun Pack" is by one of my favorite Western writers, T.T. Flynn. This is a reprint from the April 19, 1941 issue of WESTERN STORY, where it was the featured story on the cover. The set-up is familiar here, too: a teenager who is the son of a notorious outlaw and smuggler sees his father gunned down in an ambush because he was double-crossed. The protagonist takes to the owlhoot trail himself and vows to track down and kill the man responsible for his father's death. Enough time passes to give this yarn a bit of an epic feel, and then the hero finally gets a lead that takes him to a New Mexico mining boomtown. What he finds there isn't what he expected, as Flynn gives us some back-story worthy of Walt Coburn and then puts a nice twist on it. A lot more action ensues, told in Flynn's straightforward but highly effective prose. A pursuit scene across a lava bed is very suspenseful and reminded me of Louis L'Amour's FLINT. I've never read a bad story by Flynn, and this is a very good one. There's also a "fact story" about the notorious outlaw Jack Slade by Gladwell Richardson, who's best known for his fiction. 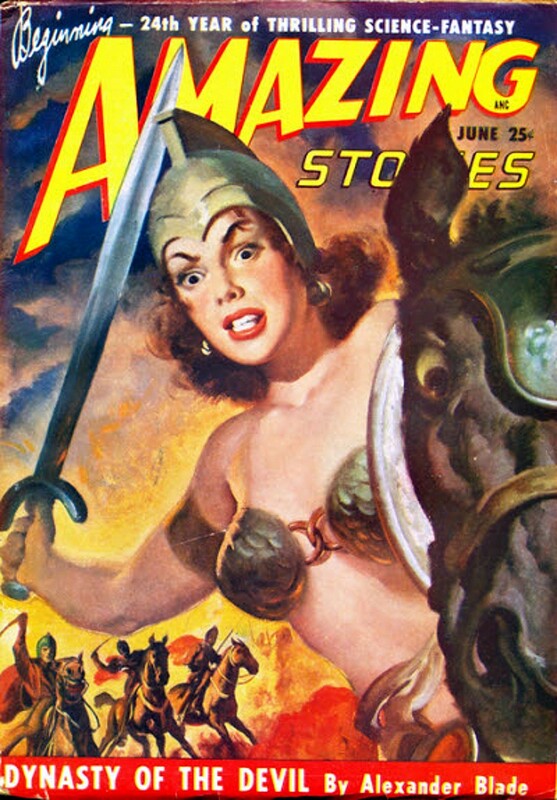 This is a pretty good article, and I'm not a fan of such historical features in pulps. 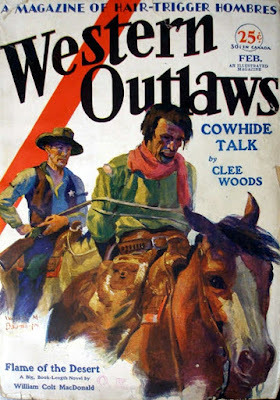 Overall, this is a really good issue of TRIPLE WESTERN with a decent triple-decker cover by Clarence Doore and three novellas well worth reading. I have more issues of this pulp and will be reading my way through them in the months to come. 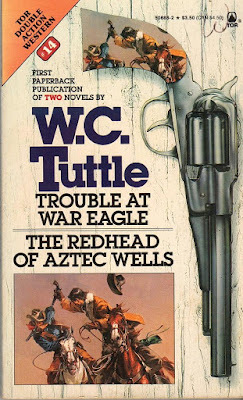 I've mentioned many times how much I enjoy W.C. Tuttle's stories and novels featuring drifting range detectives Hashknife Hartley and Sleepy Stevens. The short novel TROUBLE AT WAR EAGLE is from very late in the series, but it shows that Tuttle hadn't lost any enthusiasm for or skill in writing about his best-known characters after 30 years of chronicling their adventures. In this one, Hashknife and Sleepy stop at an isolated railroad flag depot to warm up on a cold and rainy night. They've barely gotten there when a cowboy comes in to send a telegram, and that unfortunate soul has barely started writing out his message when a shot comes from outside in the dark and kills him. The murderer gets away, but mere moments after that there's another shot, and Hashknife and Sleepy find a badly wounded man behind the depot. Nobody knows who the murdered cowboy is, but the wounded man is one of the local cattle barons, who's engaged in a hot feud with the area's other dominant rancher. Well, naturally Hashknife can't stand to see this mystery go unsolved, so he starts poking around in his usual low-key, folksy manner, assisted not only by Sleepy but also by the local deputy, "Honey" Moon, who's an old friend of theirs. (In Tuttle's stories, deputies are nearly always smarter than the sheriffs they work for.) There's a Romeo-and-Juliet romance—only it turns out "Romeo" has vanished mysteriously—and the looming threat of sheep—sheep!—moving into the valley, as well as a kidnapping and assorted shootouts. Along the way there's plenty of humorous banter but not much of the slapstick comedy you sometimes get with Tuttle. The focus stays primarily on the mystery element, which is okay with me. It's great fun watching Hashknife untangle everything. Like most great fictional detectives, he's always two or three steps ahead of everybody else, as you realize when you get to the end and see how neatly he's carried out his investigation. The history of this novel has a mystery to it as well. It was reprinted in 1991 by Tor, in a double edition along with another short novel of Tuttle's entitled THE REDHEAD OF AZTEC WELLS (which I'll be reading in the fairly near future, I expect). 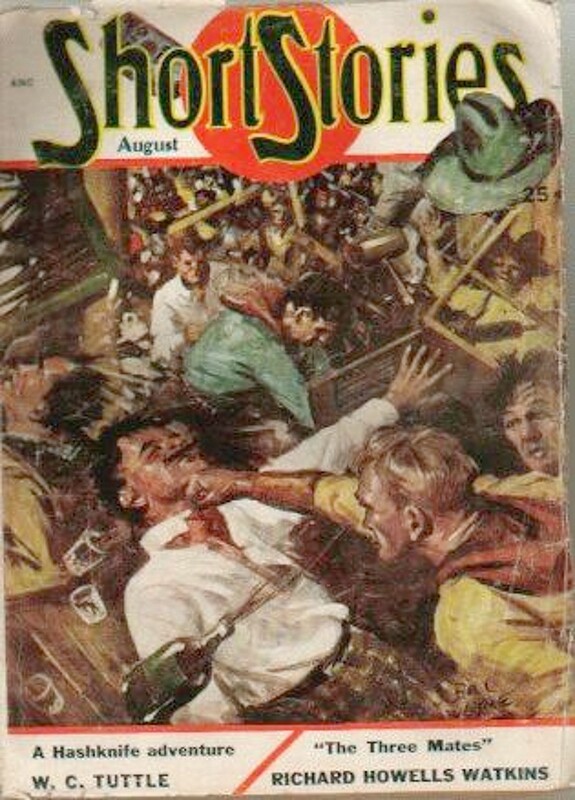 The copyright is 1950 by Short Stories Inc. The problem is, no Tuttle story called TROUBLE AT WAR EAGLE appeared in SHORT STORIES in 1950 or any other time, or anywhere else, for that matter. 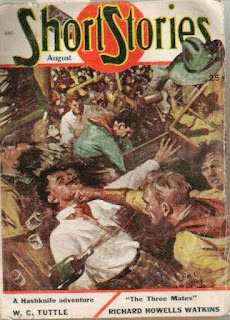 However, in the August 1950 issue of SHORT STORIES, there's a Hashknife yarn called "The Kingdom of Cole", and because there's a character in TROUBLE AT WAR EAGLE named Cole, I assume it's the same story, although I don't have the pulp to check and be certain. If that's the case, I don't know if Tuttle or the editor at SHORT STORIES came up with the title. TROUBLE AT WAR EAGLE may have been Tuttle's original title, or whoever edited the double edition at Tor may have come up with it. To me, TROUBLE AT WAR EAGLE sounds much more like a typical Tuttle title (say that three times fast) than "The Kingdom of Cole". At this late date, we'll never know, but I find such speculation interesting. The trade paperback edition of the new Rough Edges Press anthology ROCKET'S RED GLARE is now available on Amazon, and ebook editions for all platforms are available at the various on-line retailers. I just want to say how proud I am of this book and all the authors involved, and how grateful I am to them and to Brad R. Torgersen and Livia J. Washburn for their work on the cover. 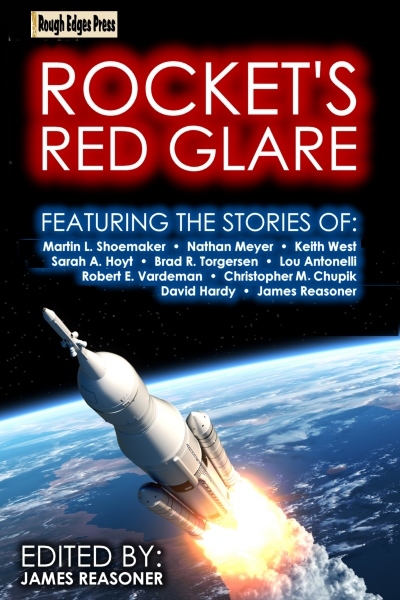 There are some great stories in ROCKET'S RED GLARE: a major new novella from Brad R. Torgersen, a USAian story by Sarah A. Hoyt, gritty military SF from Nathan E. Meyer, an interstellar epic by Keith West, a superb first contact yarn from Robert E. Vardeman, suspenseful tales set in our solar system by Christopher Chupik and David Hardy, a poignant look at the future on Mars by Lou Antonelli, and stories set on Earth but involving galactic conflict from Martin L. Shoemaker and myself. Classic SF from top-notch authors. You can't go wrong with that. FILL A STEIN AND GRAB A BLOODY HAUNCH! isn't your normal writing how-to book. You can read some dry, dusty tome about story arcs and character development, or you can let Mean Pete Brandvold grab you by the throat, give you a few good shakes like a dog trying to kill a rat, and listen to his advice on how to slap your reader across the face and get his attention. Chances are, you're more likely to write something I want to read if you go the Mean Pete route. 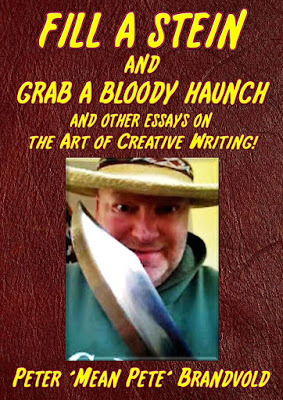 Despite the colorful trappings, however, this book will give you plenty of practical tips on narrative hooks, point of view, dialogue, description, pacing, plotting, and characterization, all from the prospective of a top professional who's been making his living as a writer for almost twenty years. And you're going to be mighty entertained in the process, as well. FILL A STEIN AND GRAB A BLOODY HAUNCH! isn't just a book about writing, though. Brandvold also includes several touching autobiographical essays and a couple of short stories. This is a fine collection by a writer I've long admired. Highly recommended. STAGECOACH: THE TEXAS JACK STORY, which seems to have gone straight to DVD, is about as cheaply made a Western as you'll ever see. The gunshots sound more like cap pistols, and all the different stagecoaches are pulled by the same pair of horses. The less said about the wig worn by one of the characters, the better. And it has that undeniable "shot in Canada" look that too many Westerns do these days. That said, I found the movie pretty entertaining. Country music star Trace Adkins plays the title character, a reformed outlaw whose efforts to go straight and build a life for himself and his new wife are ruined by a crazed ex-marshal and a vicious female bounty hunter. An almost unrecognizable Judd Nelson plays another outlaw. Those are probably the only two people in the cast you've ever heard of. There's plenty of action, some good lines of dialogue here and there, and Adkins has a great voice and screen presence. 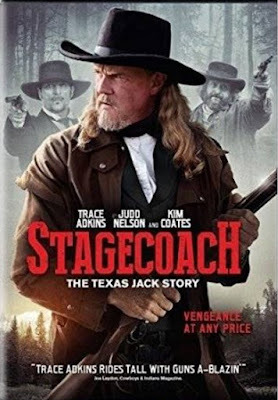 Adjust your expectations accordingly, and STAGECOACH: THE TEXAS JACK STORY is worth watching for die-hard Western fans like me. From distant galaxies to the mean streets of Hollywood . . . from the war-torn skies of France in 1918 to the far side of the moon . . . The stories in Rocket's Red Glare exemplify the adventure, courage, and sense of discovery so vital to the American spirit. Whether daring to cross interstellar space or battling alien conquerors when they come right to our own back yard, the characters in these tales never give up, never stop fighting for their country, their lives, their honor. Featuring all-new stories by Sarah A. Hoyt (part of her USAian series), Brad R. Torgersen, Martin L. Shoemaker, Lou Antonelli, James Reasoner, Robert E. Vardeman, Nathan E. Meyer, Keith West, Christopher Chupik, and David Hardy, Rocket's Red Glare is packed with space opera excitement, dazzling scientific speculation, gritty action, and compelling characters. I'm really proud of this book. This is the kind of SF I love to read. The ebook is available for pre-order through Amazon and Smashwords and will go live on Thursday, and the print edition should be available then, too. Archeological thrillers have become quite popular over the past twenty or so years, but as you'd expect when Stephen Mertz tackles a genre, you're not going to get the same old same old, as the saying goes. True, in his recent novel THE MOSES DECEPTION, you get a male/female pair of intrepid archeologists, but they're not involved in a romantic relationship as so often happens in books like this. Rather, Drs. Adam Chase and Lara Newton are partners and allies, although there is some attraction between them. Sure enough, on a dig in the Middle East, they make a discovery with implications that could change the entire world: fragments of the original Ten Commandments that Moses broke when he came down from Mount Sinai. And according to these fragments, there was an eleventh commandment that no one ever knew about because Moses kept it to himself (hence the title). Adam and Lara are already in an area plagued by violence, and this momentous discovery just puts them in more danger, as it's important enough for various factions to kill over, which is exactly what happens as the two of them try to reach safety at the estate belonging to their wealthy backer in the Swiss Alps. Much double-crossing and intrigue ensues. 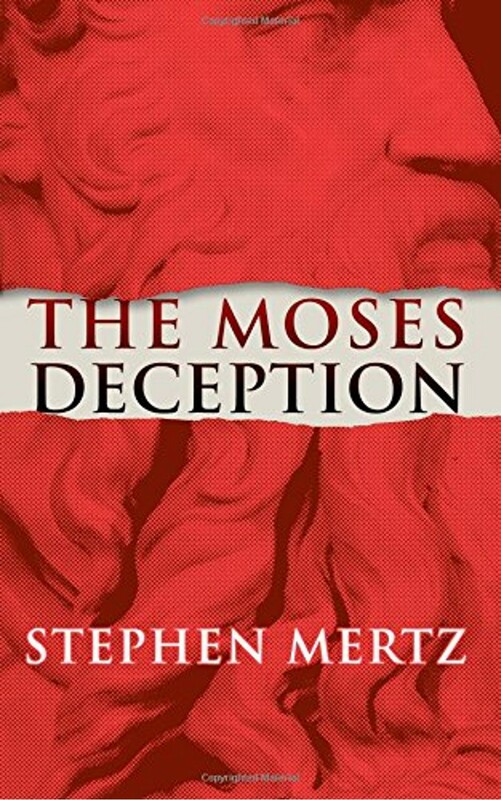 What really sets THE MOSES DECEPTION apart is Mertz's writing, which as usual is lean and fast-paced and filled with action and compelling characters. So many thrillers these days are bloated, with page after page of padding that puts me to sleep. Not so anything by Steve Mertz, who has been one of the top action writers in the business for the past forty years. 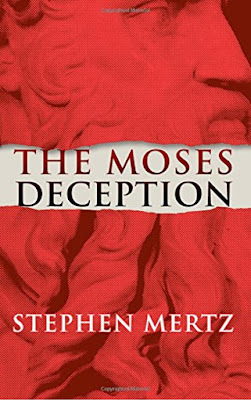 THE MOSES DECEPTION is great entertainment and highly recommended. This cover by Arnold Kohn has some obvious attributes, but what I really like is the crazed look in the horse's eye, right at the edge of the cover. Now that's a war horse. Inside, the lead story is by "Alexander Blade", who appears in this case to have been Richard S. Shaver, not a good sign. Then there's a story by S.M. Tenneshaw, also a house name, but the real author of this one isn't known. Robert Moore Williams and a handful of lesser known names round out the issue. I have a feeling that based on the fiction this may not be a top-notch issue of AMAZING STORIES, but I do like that cover. As usual for this era, a cover by H.W. Scott graces this issue of WESTERN STORY. It's not Scott's best cover, by any means, but it's not bad. The featured novel (really a novella) is "Spawn of the Gun Pack" by T.T. Flynn, one of my favorite Western authors. I'll have more to say about this story next week, when I feature a pulp I happen to own that reprints this story. Backing up Flynn in this issue is a mighty fine line-up of authors: Walker Tompkins, L.P. Holmes, S. Omar Barker, and John Colohan, I don't own this one, but with those authors I'm sure it's a fine issue. Well, I knew that if I continued reading the Ki-Gor novels in order, I'd get to some that weren't, shall we say, top-notch yarns. 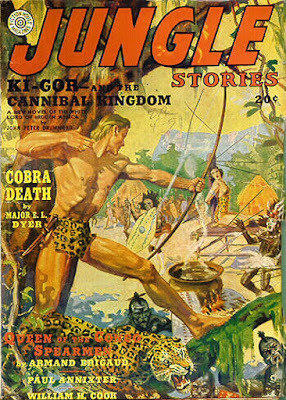 For the sake of completeness, though, a few words about KI-GOR—AND THE CANNIBAL KINGDOM, from the Summer 1940 issue of JUNGLE STORIES. First of all, it's actually not badly written. The prose flows fairly well, the settings are described nicely, and the action scenes are okay, if rather sparse. I have no idea who was behind the John Peter Drummond house-name on this one. But whoever it was neglected to come up with much of a plot. Ki-Gor goes to the aid of his old friend and sidekick George Spelvin, the former railroad porter from Cincinnati who's become the chief of the M'Balla tribe in Africa, when George and his people are attacked and besieged by a horde of cannibals. That's all there is to it. A lot of the novel consists of Ki-Gor and his beautiful redheaded wife Helene (who's given nothing to do) traveling from one place to another. There's one nice bit near the end where Ki-Gor exposes a jungle con-man, but that's not enough to save a plot that really needed a few twists. One other way in which KI-GOR—AND THE CANNIBAL KINGDOM is noteworthy is that it's the first story, as far as I recall, in which George Spelvin is referred to as Tembo George, Tembo meaning elephant (because he's a great big guy, of course). This is the name by which he's known for the most part in the rest of the series. 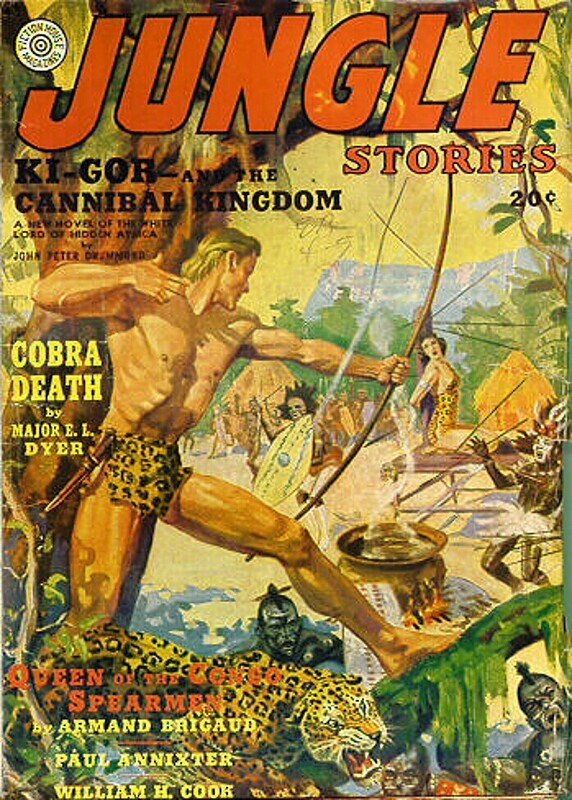 At some point I'll have to start skipping some of the stories because I don't have all of them, but I probably have 80% of the series in one form or another (all reprints except for one issue of JUNGLE STORIES). For now, though, I'm going to continue reading them in order and writing about them here from time to time. If you're following along at home, though, you could probably skip KI-GOR—AND THE CANNIBAL KINGDOM without missing much. Sad but true. We missed this Western "mini-series" (actually a glorified two-part TV movie) when it came out in 2006 and never got around to watching it until now. Robert Duvall and Thomas Haden Church play uncle and nephew, respectively, who take a herd of horses from Oregon to Sheridan, Wyoming, in 1898 to sell them to a representative of the British government looking for war horses. Along the way they wind up taking care of five young Chinese women who have been sold to a madam in a Wyoming settlement for a life of prostitution. When Duvall and Church won't turn the women over to the madam, she sends a brutal gunman after the drive to retrieve them and kill their protectors. That's the plot, which would have made a nice, taut, hardboiled 90 minute Western. 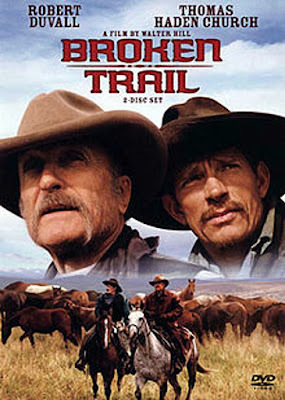 To stretch it out to twice that length, there's a lot of spectacular Canadian scenery (like so many Westerns in the past 20 years, BROKEN TRAIL was filmed in Alberta), some romance, and a lot of scenes of the horses being driven along. The pace is leisurely, even meandering. But eventually, even most of the scenes that seem like filler do have some sort of payoff, and the ending is very satisfying. What really makes this film work are the performances of Duvall and Church, both of whom have the sort of weatherbeaten, lived-in faces appropriate to Westerns. Duvall, of course, can do this sort of stuff in his sleep, but he works at it and doesn't phone in his performance. I think of Church primarily as a comedic actor, but he's fine as a cowboy with a stubborn streak, and impressive enough that I wish he'd made more Westerns. Greta Scacchi is also good as a soiled dove who throws in with them to get away from her life. BROKEN TRAIL is one of those movies that has a lot of excellent individual scenes. While those scenes don't add up to a great Western, it is a good one, very watchable and entertaining. I like the George Gross cover on this issue of NORTH-WEST ROMANCES. Inside are stories by Dan Cushman, one of the stars of the Fiction House line, Tom O'Neill, who wrote some other stories I liked, long-time Western pulpster and paperbacker Lee Floren, the prolific house-name John Starr, and a couple of authors I'm not familiar with, Curtis Bishop and Stuart Friedman. Just another day in Canada, obviously. The title of this pulp is a mouthful. That's not a particularly good cover, either. However, this issue of WILD WEST STORIES AND COMPLETE NOVEL MAGAZINE features William Colt MacDonald's Three Mesquiteers novel "Riders of the Whistling Skull", which was made into one of the better entries in the long-running B-Western movie series. And the back-up story in this issue is by Carl Jacobi, better known for his weird fiction and his adventure stories than for his Westerns. So I find it interesting and hope you do, too. Captain Future, for those of you who don't know, was a pulp hero whose space opera adventures appeared in a series of novels in his own magazine and then in STARTLING STORIES. His real name was Curt Newton, and there's a touch of Doc Savage influence in his background, as he was raised in a laboratory on the Moon by Simon Wright, a scientist whose disembodied brain lives on in a box, a giant robot called Grag, and a shape-shifting android named Otho. When he was just a baby, Curt's parents were murdered by an evil rival scientist, so he grows up sworn to battle crime across the Solar System, along with his three strange allies who come to be called the Futuremen. 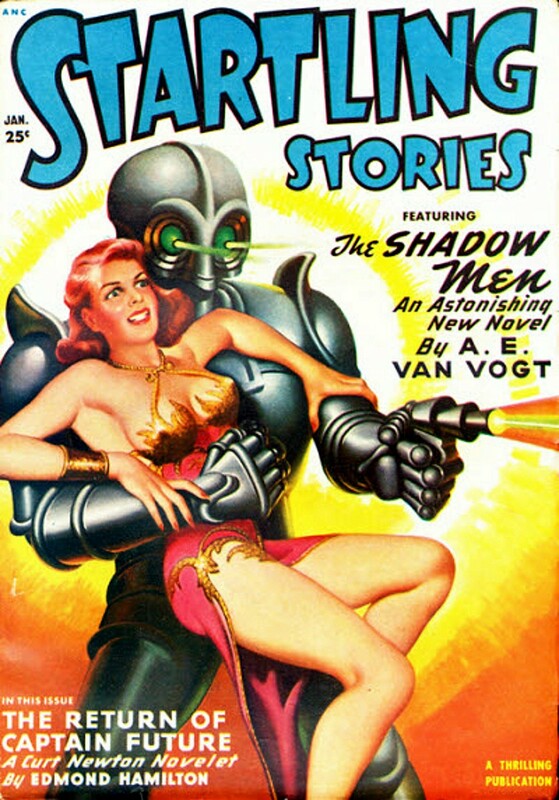 This series was created by editor Mort Weisinger and written mostly by Edmond Hamilton. The stories start out fairly juvenile but great fun, and when some of them were reprinted in paperback during the Sixties (my introduction to the series), I ate 'em up, reading and enjoying every one I could get my hands on. Later on, I was able to find some of the original pulps and read a few of the novels that weren't reprinted. The thing of it is, although the series may have started out being aimed primarily at kids, it evolved over time as Hamilton began writing more serious science fiction. The juvenile trappings are still there all the way through, but the plots widen to an epic level as Curt Newton and his friends tackle such mind-boggling mysteries as the origins of humanity and the creation of the universe itself. In the late Forties the series, which by then was appearing in STARTLING STORIES, disappears for more than three years. But the cover of the January 1950 issue of the magazine (an iconic cover painting by Earle Bergey, by the way) heralds "The Return of Captain Future", and Curt's back, all right, along with all his supporting cast. In an unusual move for the pulps, the story accounts for Captain Future's absence by explaining that he and his Futuremen set out more than three years earlier on an expedition to find the Andromeda Galaxy. In previous adventures, they had found evidence that this is where the human race originated. But they never came back, and everyone assumes they died somewhere out there in the far reaches of space. Of course, that's not the case. On a visit to the moon laboratory, Joan Randall, a member of the Space Patrol who also serves as Curt's romantic interest, and the grizzled old space marshal Erza Gurney discover that Curt and the Futuremen are not only back, they've brought with them the only surviving member of an ancient race of conquerors that once ruled the galaxies. This incredibly powerful alien being is held in stasis at the moment, but Curt plans to revive it so he can interrogate it. Well, of course, things do go wrong, but how they play out might not be exactly what you'd expect. The resolution is more in line with Hamilton's increasingly serious approach to the series, and by this time the old World-Wrecker (as Hamilton was sometimes known) had developed a definite poetic streak in his writing. The ending of this story had me nodding my head and saying out loud, "That's good stuff." 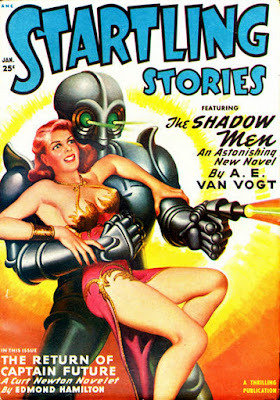 "The Return of Captain Future" is the first of seven novellas to appear in STARTLING STORIES in 1950 and '51. I had never read any of them until now, but they're all collected in a trade paperback called CAPTAIN FUTURE: MAN OF TOMORROW. I'll be reading the rest of them and posting about them as the weeks go along. For now, if you're looking for space opera yarns with a slightly more serious slant that are still highly entertaining, you can't wrong with Captain Future. I remember watching Bob Hope . . . well, as far back as I can remember. He was always on TV when I was a kid: hosting the Academy Awards, doing one of his frequent specials, or in some old movie being rerun. But despite that, I never saw MY FAVORITE BRUNETTE until now. Hope plays a hapless baby photographer who winds up in prison and is about to be executed for murder. But before he's taken to the gas chamber, he tells his story to a group of reporters, and that leads to the flashback that takes up nearly all of the movie. It seems that his photography studio is next door to the office of a private detective (played in an uncredited cameo by a big star of the day) and Hope's character has always wanted to be a detective himself. As he says in a voice-over, "All it takes to be a detective is courage, brains, and a gun. I had a gun." Naturally, one of the real detective's potential clients comes in, mistakes Hope for him, and he plays along with it, hoping for some excitement. It certainly doesn't hurt that the client is a beautiful brunette. Hmm, a brunette in a Bob Hope movie . . . who else is it gonna be but Dorothy Lamour? 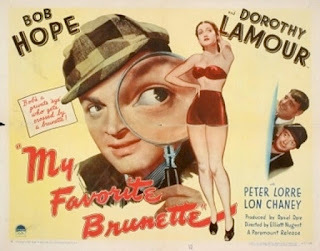 MY FAVORITE BRUNETTE is a movie that's consistently amusing without being laugh-out-loud funny except on rare occasions. The mystery plot is convoluted but mostly makes sense. Hope is his usual wisecracking schnook whose patter breaks the fourth wall now and then. Peter Lorre doesn't have much to do except act sinister, which he could do in his sleep by that point. Lon Chaney Jr. plays a dimwitted sanitarium attendant, a characterization that leads to at least one OF MICE AND MEN joke. This is certainly a decent film, although I wouldn't put it in the top rank of Hope's movies. I'm glad we finally watched it. The Copper Kings of Montana are at war—and Kate and J.D. Blaze are caught in the middle! 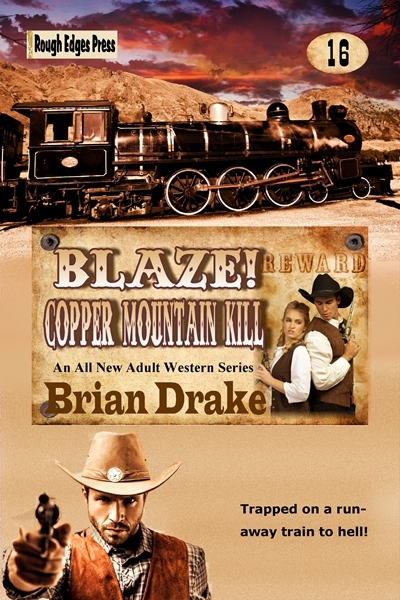 Hired to get to the bottom of the sabotage and murder plaguing the mines, the Old West's only team of husband-and-wife gunfighters tackle crooked lawmen and a band of vicious outlaws known as the Lion Gang, only to find themselves trapped on a runaway train loaded with dynamite, a bomb on wheels that threatens to blow the Blazes sky-high! Acclaimed thriller author Brian Drake (THE TERMINATION PROTOCOL) joins the Blaze! team with a novel packed with excitement and mile-a-minute action. COPPER MOUNTAIN KILL is Western adventure at its finest. 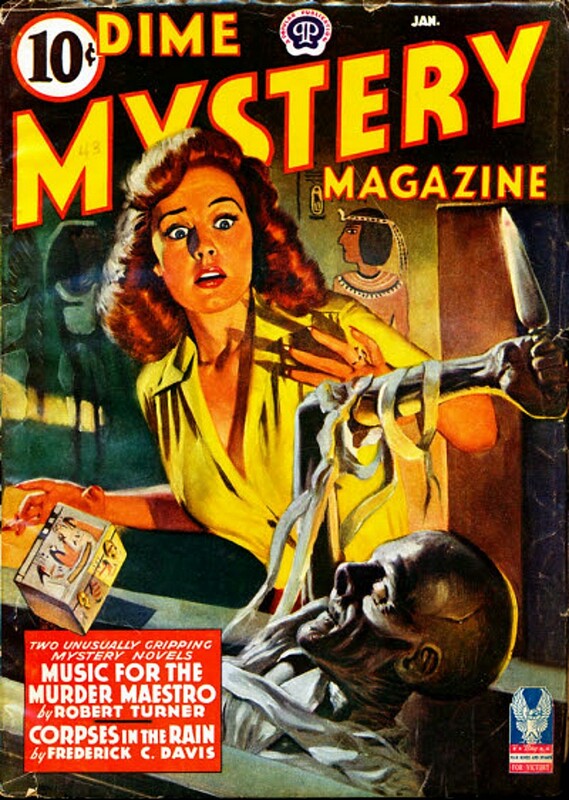 This issue was published after DIME MYSTERY's Weird Menace phase, but the magazine still featured some pretty creepy covers, including this one. The main appeal for me, however, is that gorgeous redhead. And of course, stories by Day Keene, Fredric Brown, Frederick C. Davis, and Robert Turner. None of whom, I imagine, are as good-looking as that redhead . . . but I digress. 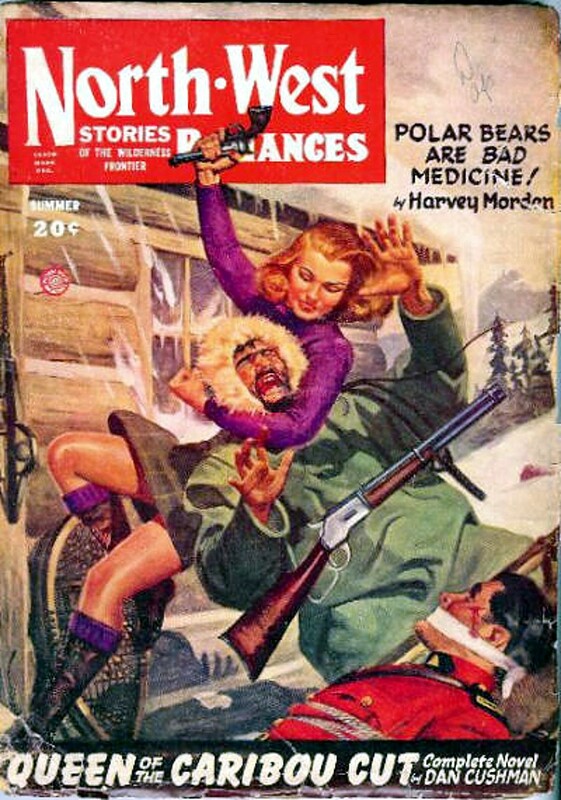 Well, things don't look too good for the hair-trigger hombre in front on this cover by Walter Baumhofer. Of course, you never know what will happen, and I doubt if things will go smoothly for that star packer behind him. 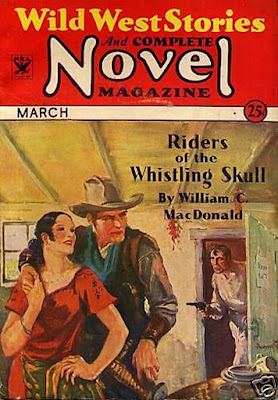 A Western reader ought to be pretty pleased with this issue, though, considering that it includes stories by William Colt MacDonald, E.B. Mann, Philip Ketchum, Bennie Gardner, Clee Woods, and Lawrence A. Keating, among others. Forgotten Books: The Best of Spicy Mystery, Volume 2 - Alfred Jan, ed. All of these are good stories and I enjoyed them a great deal, but there are some stand-outs. Victor Rousseu's "She Who Was He!" is a pretty bizarre tale of involuntary transgenderism (!) and murder. "Taupoo Dance" by Robert Leslie Bellem has an unusual setting for a Weird Menace story: a tropical island in the South Seas. 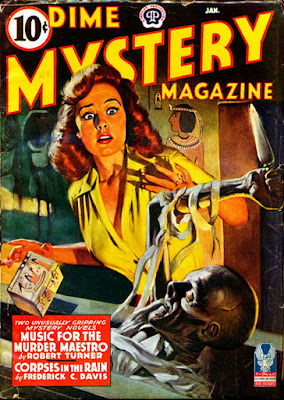 "Blind Flight" by Edwin Truett Long takes place for the most part on an airplane flying through dense fog, also not a typical Weird Menace setting, and Long's "Red—For Murder" is a pretty good crime yarn with several nifty twists packed into a few thousand words. I've never read much by Long, but those two stories impressed me. His other entry in this volume, "False Face", starts out well but kind of falls apart at the end. As for the more traditional Weird Menace stories, Bellem's "Labyrinth of Monsters" is my favorite; grisly and very action-packed. I don't know if there'll be a third volume in this series, but if there is, you can bet I'll read it. Brock Clemons rides into the small town of Dry Springs simply looking for a place to grab a cigar and a good night’s sleep. Instead, he finds a town being strangled by a band of hardened outlaws, a young boy named Huck who is bravely facing challenges far beyond his years, and Sophie, a woman of captivating strength and beauty. Brock decides to stay beyond the one night he had planned, but will his intelligence, courage, and unmatched skill with a gun be enough to save the town, help Huck, and win Sophie’s heart? 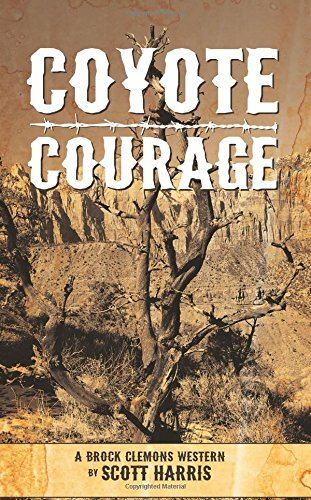 In his debut novel, Scott Harris has done a good job writing a traditional Western in the classic mode, reminiscent of Louis L'Amour with its first-person narration, clear-cut distinction between good and evil, and action scenes that are fast-paced and exciting without being graphically violent. The plot takes an unexpected twist or two and there are some nice lines of dialogue, but where Harris really excels is with his characters. Brock Clemons is a fine protagonist with an intriguing history, a man raised in England but not out of place in the Old West, well read, gentle and reflective most of the time but plenty tough when he needs to be. I also like the youngster Huck, who comes across as a real boy, not just a character type or a grown-up in a child's body. 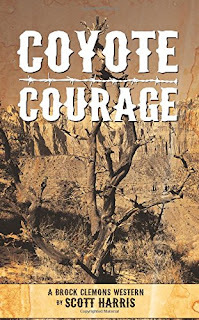 For fans of traditional Westerns, COYOTE COURAGE is well worth reading. 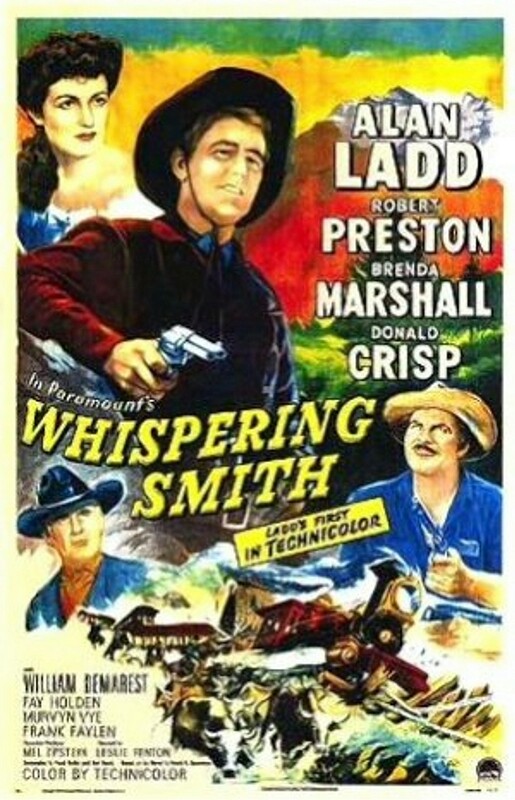 WHISPERING SMITH is another Western that played frequently on TV when I was growing up, but I never watched it until now, possibly because I've never been a big fan of Alan Ladd. Not that I dislike Ladd's movies, by any means, and he's the star of SHANE, after all, which is one of my favorites. But I've also never gone out of my way to watch his films. This one is based on an early (1916) Western novel by Frank H. Spearman that I've never read, so I can't say how it compares. Ladd plays a railroad troubleshooter named Luke "Whispering" Smith, supposedly because of the way he's able to sneak up on bad guys. Robert Preston plays a roguish old friend of his who also works for the railroad, but in addition to that, he's established a ranch and he's married to the woman Smith used to be in love with. A clash with a by-the-book new superintendant on the railroad puts Preston's character on the owlhoot trail, so you know that eventually it'll be Whispering Smith's job to bring him to justice. The romantic triangle and the friction between two old friends on opposite sides of the law form the core of WHISPERING SMITH, and since it's only an hour and a half long, that's enough. The supporting cast includes Donald Crisp as the boss of the outlaw gang Preston's character throws in with, William Demarest as another railroad worker, and an almost unrecognizable Frank Faylen as an evil albino gunman named (what else) Whitey. I know Faylen mostly as Dobie Gillis's dad, harried grocery store owner Herbert T. Gillis in the TV show THE MANY LOVES OF DOBIE GILLIS, as well as the likable taxi driver Ernie in IT'S A WONDERFUL LIFE, and seeing him playing a snarling killer in this movie is just . . . odd. Also odd is the way everybody wears their guns in such a high-waisted fashion. If you look at historical photographs, that may be more realistic, but it looks strange in a Hollywood Western from 1948. Ladd is pretty good as Whispering Smith, Robert Preston is always fun to watch, but I didn't care for the third side of that romantic triangle, Brenda Marshall, and I've liked her in other films. I was also a little disappointed that there was no fight on top of a moving train. If you're making a movie about railroaders, you've got to have that, don't you? WHISPERING SMITH is an okay Western at best. I'm glad I finally saw it, but it's not one I'll ever watch again.